$175 k Renovation with awesome water views front and back! Top of the Line! 3 bedrooms, 2 full bathrooms and additional pull out sofa (in bedroom). For Your Protection: Harborview Realty on Marco manages our property. Never WIRE Money to anybody! Enjoy our completely remodeled luxurious canal front home with long water views in back and water views in front on Marco Island. 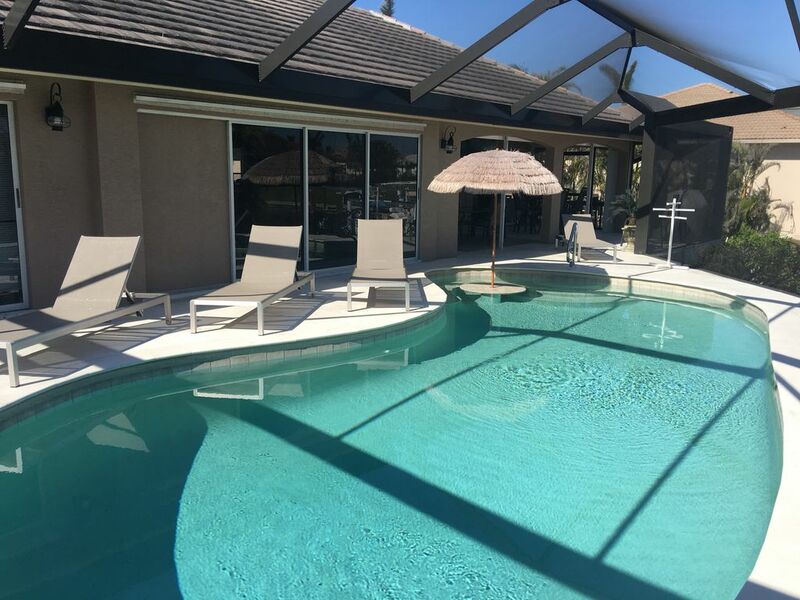 Sit in 25x13 ft heated pool with tiki umbrella, table and bench seating in the pool. Pool has unobstructed SOUTHERN exposure. House is on extra large end lot with no construction on abutting properties. Flat screen LCD TV's thru out including 42' in family room, 50' LCD outside under covered lanai, 37' LCD in MBD and 32' LCD in guestrooms. Sunbathers will enjoy laying on the dock or pool side (4+ lounge chairs). Beautifully decorated with top of the line comfortable new furniture thru out, new patio furniture, new kitchen, new master bath '17, new guest bath '17, newly painted '17, new shell stone floors '17, new baseboards/moldings '17, new epoxy painted garage/walkways '17. The twin bedroom has a pull out couch to sleep 3 - 4. Master bathroom has luxurious soaking tub & large separate shower as well as separate toilet room. Located at 349 Lamplighter Drive (premier address on southern end of Marco Island). Our home is located at the end of the canal so long water views abound. All new Sealy Posturepedic beds, beach chairs, umbrellas, beach towels, top linens, etc. More than $75,000 in improvements including new dock, new shell stone travertine pool decking/coping and new screen lanai cage were completed in September/October 2016 and $100 k in improvements October 2017! *No cats - owner allergic. Dogs considered. Activities: 1 paddle board, 2 kayaks, fishing rods (fish off the dock), coolers, beach chairs, beach towels, beach umbrellas, bicycles (at least 4), blenders, martini glasses, you name it it is likely there. Top of the line linens top it off for that Ritz Carlton experience. Why rent a house when you can rent a home? : Our home has been set up for our personal use and as such everything is in place to offer you a relaxing vacation. Our home was built in 1996. Enjoy the beaches of Marco Island (1/2 mile away) and unwind! My wife and I love it and are sure that you will too! - Marco dining (Arturo's, Snook Inn, Nacho Mama's, Di Vinci's. We have been renting our two homes on Marco since 2004. We take it seriously and have tremendous pride in our homes and the experience of our guests. We work our tails off to update our homes (we have 2). We maintain them to 5 star standards and refresh the homes on a regular basis. On island property management. If you were to ever have any issues, you have local representatives to resolve quickly. We travel regularly to Marco and stay in our homes. This affords us the same experience you will have and enables us to prioritize any items that need to be updated. As you can see by our most recent update spend, we want it to be right! Master bedroom bath is large with sunken shower, soaking tub, separate toilet room with fan, double bowl vanity and large walk in closet. Guest bathroom has new vanity, granite counter top and faucet. The entire house has been repainted (inside and out). This house has everything you need for a great stay. It was very clean and near all the restaurants. We are certainly glad you enjoyed your Stay and look forward to your return visit. Great stay again for 2nd year in a row. Nicely updated and super clean and well maintained. The property was as described. Great view along the canal. Our family loved how spacious the house was and the decor inside. Not to mention it was spotless! The House was fully stocked with everything needed for a great vacation (ie bikes, Paddleboard kayaks, fishing poles) My children loved the convenience of fishing off of the dock and swimming in the enclosed pool. We enjoyed some really good meals at Cafe de Marco, CJ’s, Mango’s by the dockside and Joey’s Pizza. My family and I really enjoyed our stay here and can not wait to go back! This was our first trip to Marco Island, which we just loved, and to stay in such a lovely home made it perfect! This beautiful house had everything we needed with comfortable beds, a beautiful view of the canal and our own pool that never closed! Having a nice dock to park our boat at was the cherry on top. We enjoyed and appreciated having fishing poles, kayaks and beach gear at our disposal. This whole experience including the easy rental process and prompt communication responses made our vacation fun, relaxing and effortless. We certainly hope to return again soon. This was a wonderful spring break trip for our family and a big part of that was this wonderful rental house! It really felt like our home and had everything (and more) that we could have needed for a great trip. The house is well maintained, very clean, spacious and comfortably furnished. The location is really wonderful! Its located in a beautiful, quiet and safe neighborhood that is a short drive to most places. We enjoyed taking early morning and evening walks with our dog and often saw friendly neighbors enjoying the outdoors too. The location on the canal was great and there was no boat traffic on the canal at all so we felt safe with our kids kayaking and paddle boarding right off the dock. Speaking of that, the amenities and things provided with this rental was beyond anything we have ever had in a rental and would have cost a lot to rent individually. The garage was stocked with 2 kayaks, a paddle board, several bikes (even helmets! ), tons of beach chairs, pool toys, sand toys, fishing gear, coolers, and more! The kitchen was well stocked with everything you could need and had nice, clean and updated appliances. Although we mostly cooked on the nice outdoor grill! The outdoor TV was a plus and my husband enjoyed watching the Masters while relaxing by the pool! The fishing off the dock was so fun and my kids did that for hours! We went to the JW for Easter brunch but all of us could not wait to get back to the relaxation of our house with our own pool and none of the crowds! The owner was a pleasure to work with and would respond almost immediately to any messages sent. He was very accommodating to allow us to bring our dog and also arrange for us to stay an extra day! We have rented a lot of vacation houses in many different destinations and this one was definitely one of the best! We are already thinking of when we can plan another stay! Thank you again for a great vacation for our family! Wow. I would personally like to thank you for taking the time to write this review. We try our hardest to have our home in the best condition we can and provide everything you might need and then some for a perfect vacation. We look forward to your return visit! Our home comes with bicycles,a kayak, coolers, beach chairs, umbrellas, linens (top of the line) and all other amenities. Terrific rates for a quality cared for home that has been professional decorated! The kids will love the in-pool seating area with table and umbrella. Pool has UNOBSTRUCTED SOUTHERN EXPOSURE! No extra charge for pool heat! Bicycles, kayak, beach chairs, coolers, TV pool side! Relax and enjoy.